Starter What do you understand by the word Psychology? 1 Starter What do you understand by the word Psychology? Write a short and simple definition in your book. The dictionary definition of Psychology is: Psychology is the scientific study of the mind, and of the reasons for people’s behaviour. UNIT 1: Perception and Dreaming How we see our world. Is dreaming meaningful? 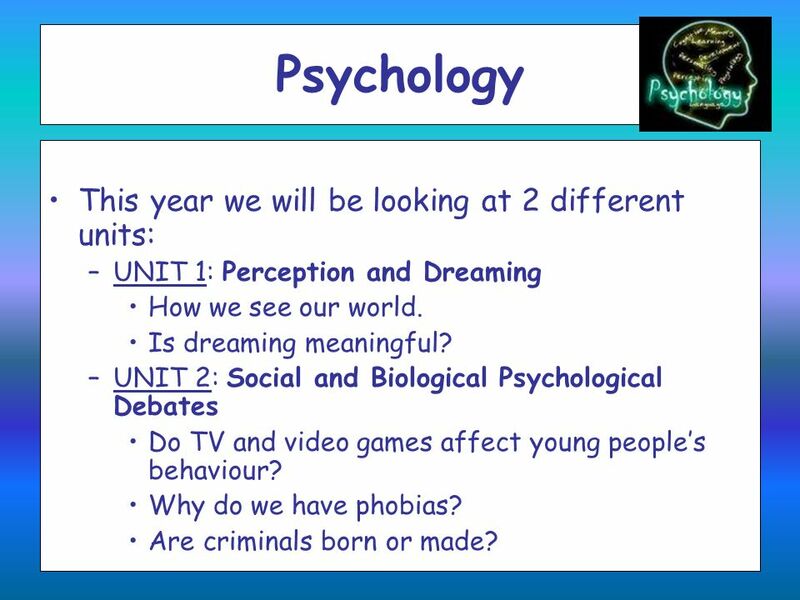 UNIT 2: Social and Biological Psychological Debates Do TV and video games affect young people’s behaviour? Why do we have phobias? Are criminals born or made? 4 How do we see our world? Do we see things the way things really are? Or are our eyes (or our brains) sometimes fooled? 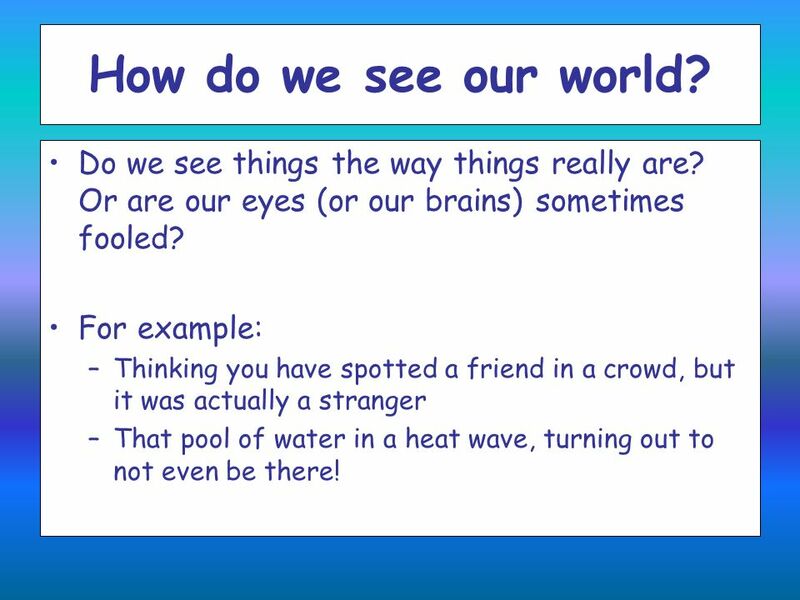 For example: Thinking you have spotted a friend in a crowd, but it was actually a stranger That pool of water in a heat wave, turning out to not even be there! Psychologists call seeing and understand the world ‘perception’. 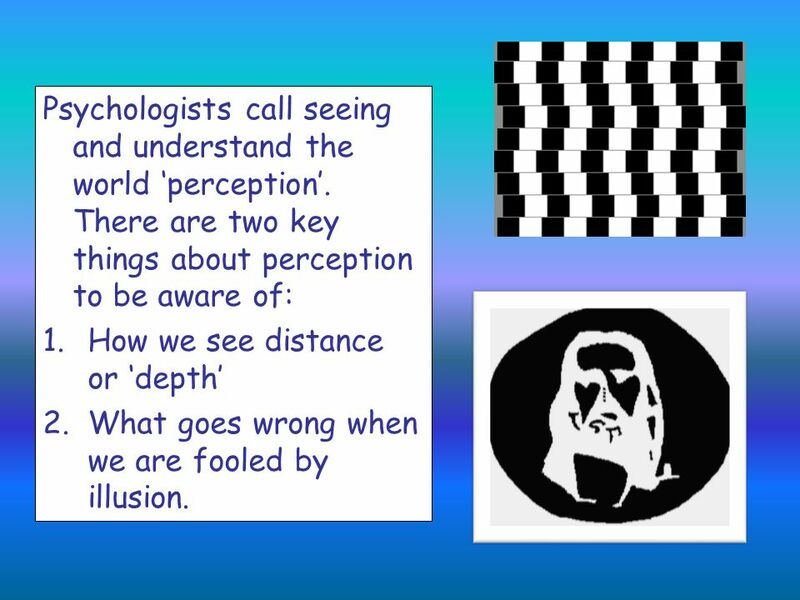 There are two key things about perception to be aware of: How we see distance or ‘depth’ What goes wrong when we are fooled by illusion. 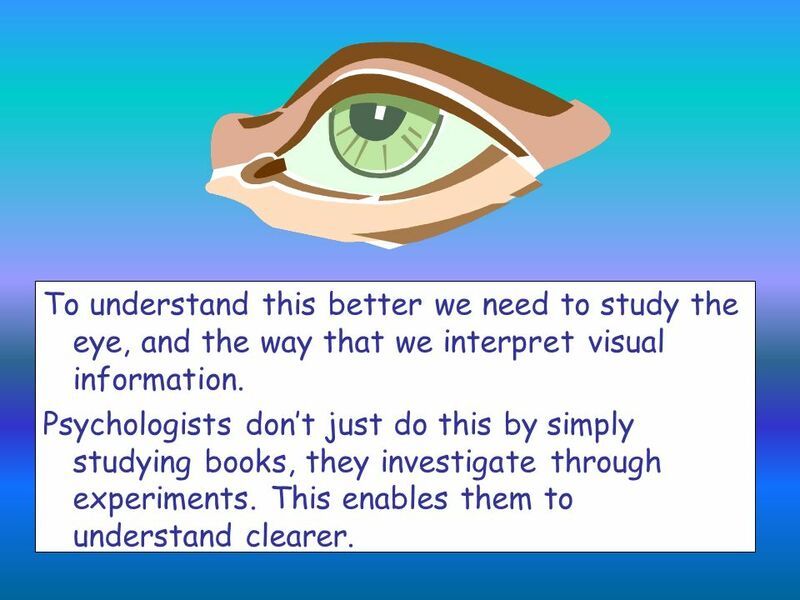 6 To understand this better we need to study the eye, and the way that we interpret visual information. Psychologists don’t just do this by simply studying books, they investigate through experiments. This enables them to understand clearer. 7 How do we see? We use our eyes to see the world. If you close your eyes and pick up an object, you can work out it’s shape etc, but you can’t see the colour, pattern or detail of the object. Our eyes help us to detect all these things about objects without having to touch them. When we are not touching an object, we rely on our eyes to give us information about the world: shape, size, texture, colour, distance from us. PERCEPTION: Most objects in the world reflect or emit rays of light that we can see. Seeing is the process of detecting this light from objects. It is a biological process that happens in our eyes. Perception is more than that. Perception is the way we make sense of the visual image. This is what happens in the brain and allows us to understand what we can see. 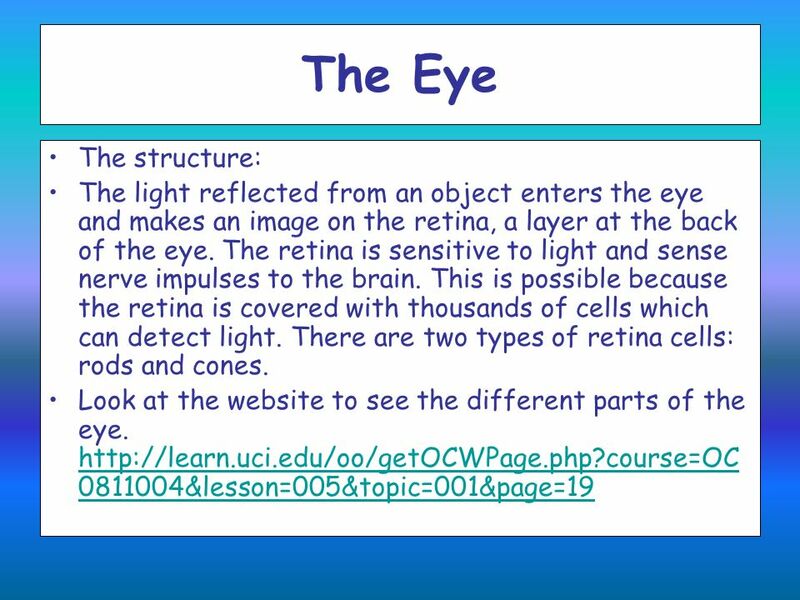 8 The Eye The structure: The light reflected from an object enters the eye and makes an image on the retina, a layer at the back of the eye. The retina is sensitive to light and sense nerve impulses to the brain. This is possible because the retina is covered with thousands of cells which can detect light. There are two types of retina cells: rods and cones. Look at the website to see the different parts of the eye. Rods are very sensitive to light and they also respond to movement. A rod cell will respond even when only very dim light falls on it. They are found mainly around the edge of the retina. Have you ever noticed something moving ‘out of the corner of your eye’? This is happens because the light moves across the side of your retina and is detected by rods. Cones are found mainly in the centre of the retina, just opposite the pupil. This area helps us to see clearly and in detail as there are lots of cones packed very close together. Cones are less sensitive to light than rods, so they only work in bright light. Unlike rods, cones can detect different colours of light. Our colour vision therefore relies on our cones. Rods and cones are special nerve cells. When enough light falls on a rod or cone, the cell responds by sending a nerve impulse. All the nerve impulses from rods and cones across the whole retina are sent to the brain. 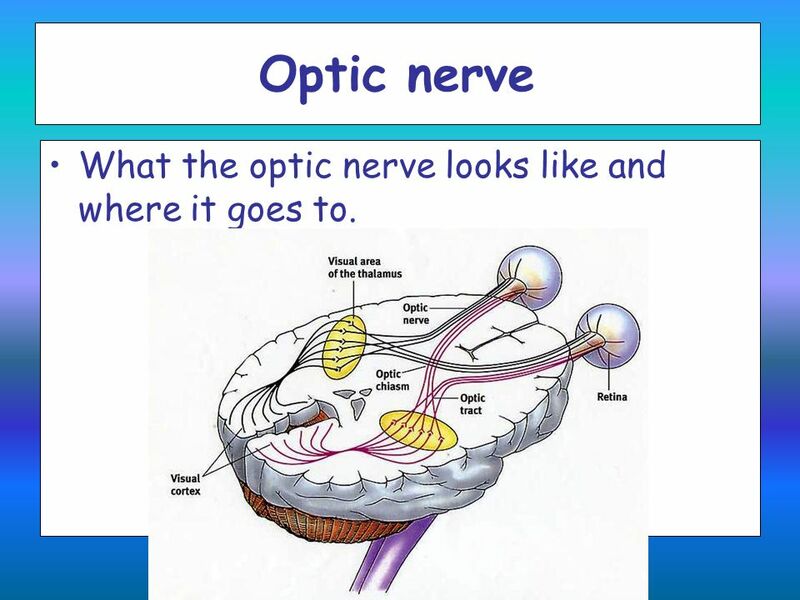 The nerve impulses trail along other nerve cells which are bundled together in the optic nerve. We use the words ‘blind spot’ to mean all sorts of things. Some people say they have a blind spot for maths, this means they cannot set how maths works. For psychologists, the blind spot means the same thing, it is the part of the world we cannot see. 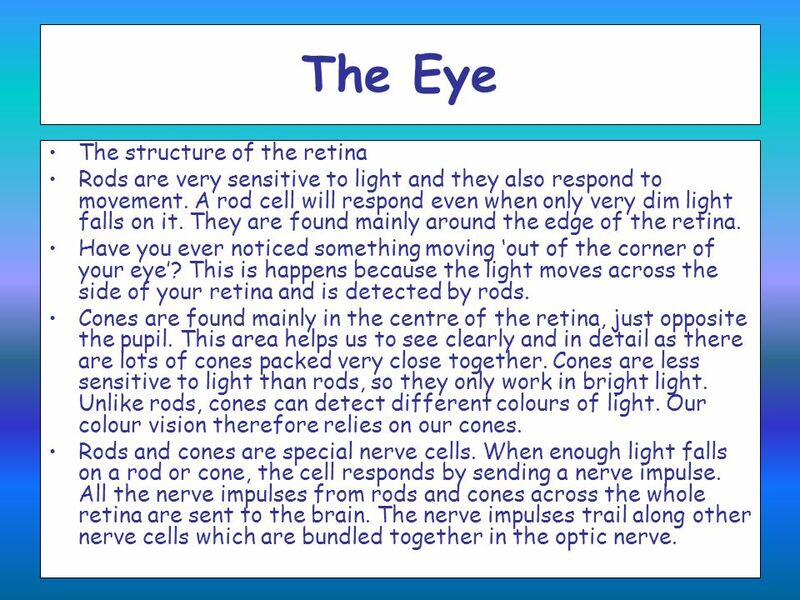 Think back to how the retina responds when light from an object falls onto the rods or cones, and that the optic nerve carries messages to the brain. 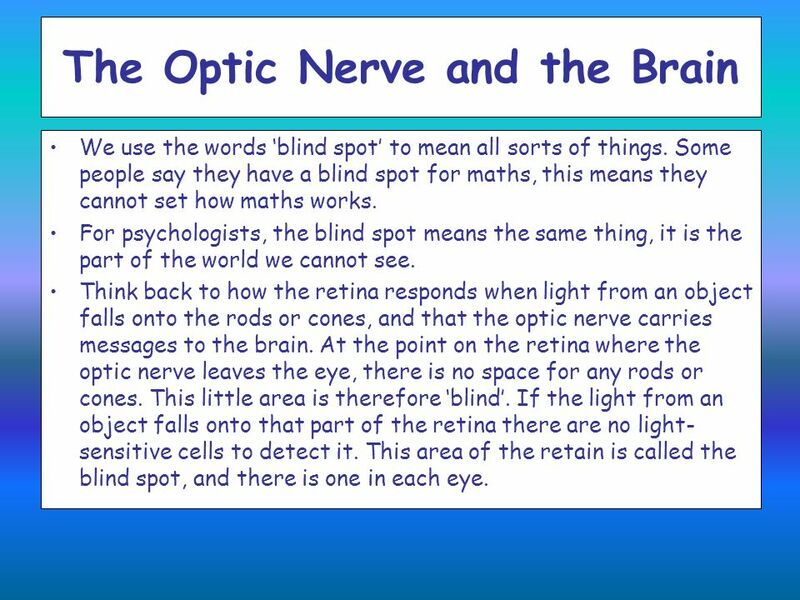 At the point on the retina where the optic nerve leaves the eye, there is no space for any rods or cones. This little area is therefore ‘blind’. If the light from an object falls onto that part of the retina there are no light-sensitive cells to detect it. This area of the retain is called the blind spot, and there is one in each eye. 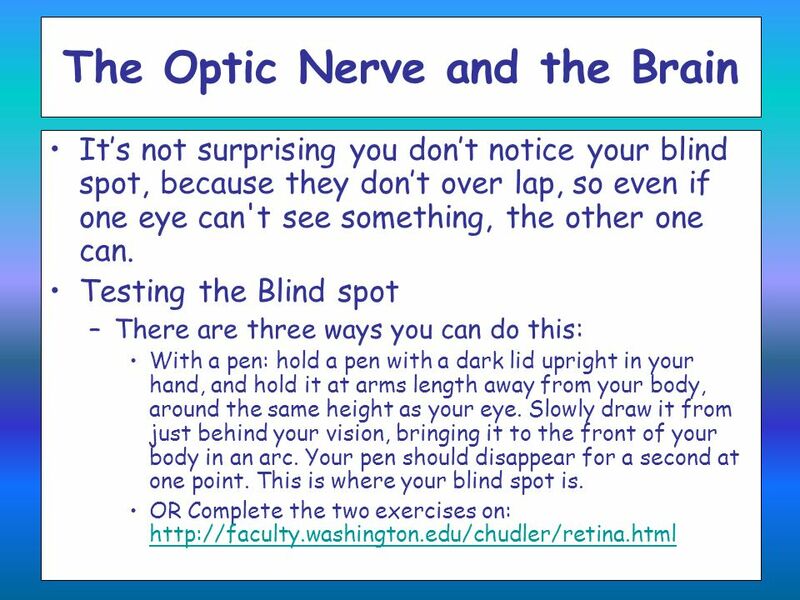 12 Optic nerve What the optic nerve looks like and where it goes to. 13 Homework Go to Highfield Humanities homepage and click on Revision. 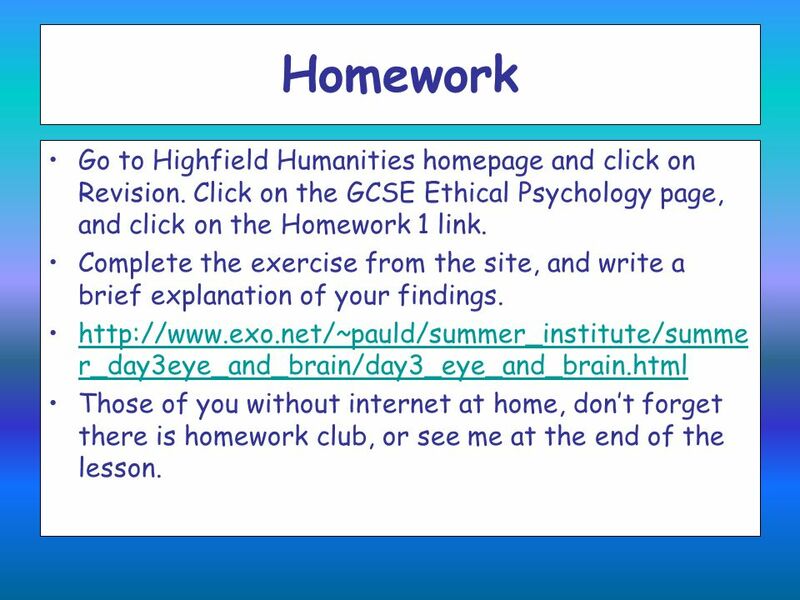 Click on the GCSE Ethical Psychology page, and click on the Homework 1 link. Complete the exercise from the site, and write a brief explanation of your findings. Those of you without internet at home, don’t forget there is homework club, or see me at the end of the lesson. 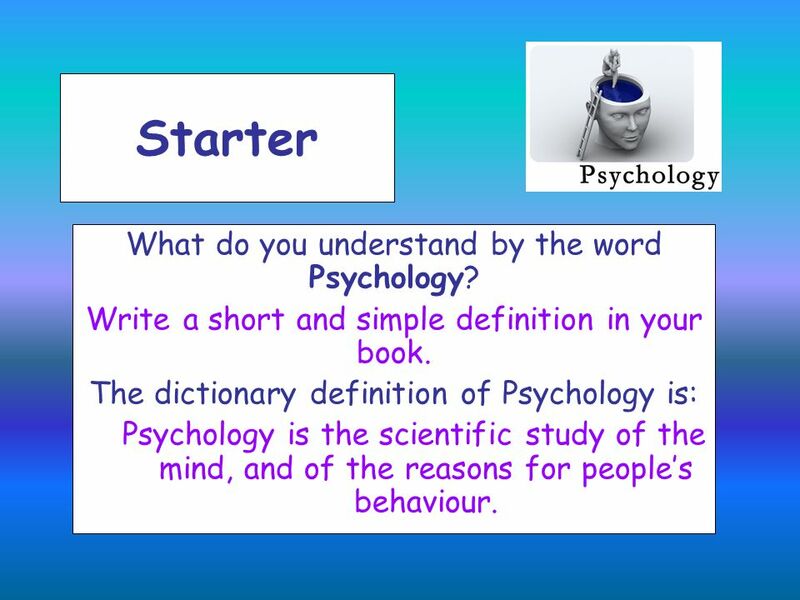 Download ppt "Starter What do you understand by the word Psychology?" Lesson Objectives Explain how light travels Explain how we see objects Know how shadows are formed. Pg 54 of IAN. Objective: To identify how parts of the eye function. Recap – lesson 1 What is perception? 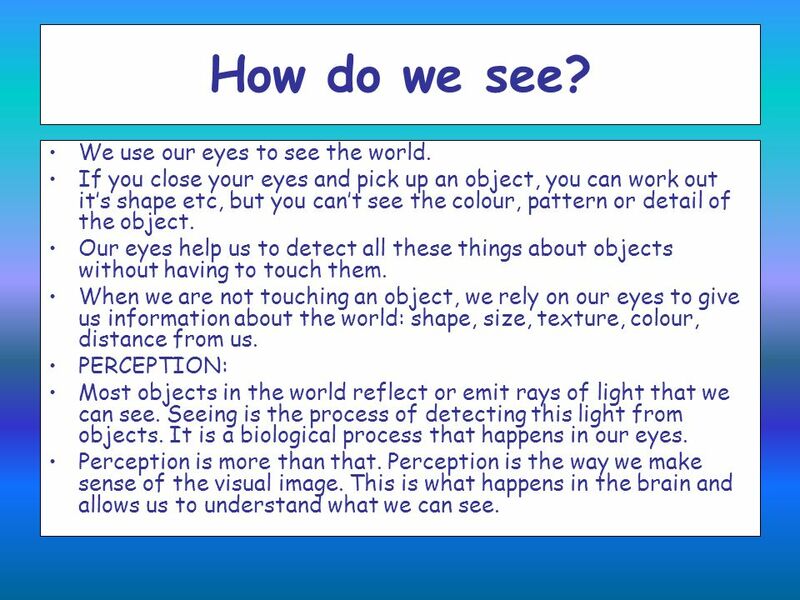 Perception: The process which we give meaning to sensory information, resulting in our own interpretation. What is. Light – Part 2 Seeing Year 7 Science. Front View of the Eye. THE SIGHT. INDEX Characteristics Parts of the sight What is each part How the eye works Photos End. Visual Perception How the eye works. Anatomy of the eye.. The Eye: The eyes are the organs of the special sense of sight. They sit in the orbit of the skull which provides them with positional. PSYCH JOURNAL 9/24/2013 Vision is the most frequently studied sense. Why do you think this is the case? Why is vision so important? How would your life. Sight Smell Hearing Touch Taste Why are the senses important? Unit 1: Perception & Dreaming How do we see our world? How we see: LIGHT Anatomy of the Eye. Pair Quiz! Write the numbers on your piece of paper Next to each number write what species the eye belongs. África Díaz Sánchez-Beato.  Introduction  The eye and the vision  Parts of the eye  How the eye works  Video.